With summer coming, people are no doubt looking forward to the holidays they’d spend out of town with friends and family. Where better to spend your summer vacation than in Boracay? (Well, there’s Palawan, Bohol and Puerto Galera, but Boracay is Boracay!) I’ve spent summer in Boracay before, arriving a week before Easter, and leaving shortly after. It was a wonderful two weeks of sun, sea and sand, and it was amazing seeing how the place change and get heavily populated as people come in by the plane and boat load to swim all day and party all night. But before you dream about the fine white sand of Boracay beach, you have to figure out how to get there first. 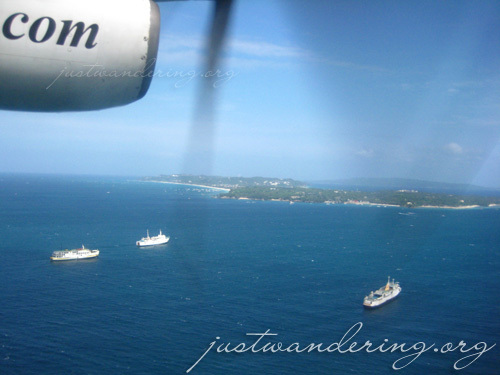 If you’re coming from Manila, Boracay is 35-minute away onboard Seair’s Dornier 328. Going to the airport from my house takes longer than the actual flight to another island! Seair also flies direct from Clark (Pampanga) and Puerto Princessa (Palawan). The smaller aircraft in the fleet, the 19-seater LET-410 takes longer, around 50 minutes (from Manila), but hey, I can live with the 15-minute difference. 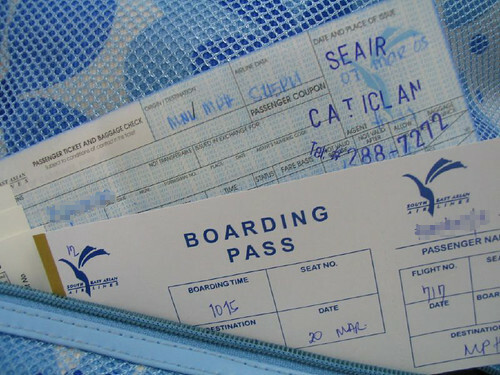 There are other local airlines that flies direct to Caticlan airport, which is closer to the Caticlan Jetty Port (the jump off point to Boracay island), but only Seair provides their passengers with complimentary shuttle transfers from the airport to the jetty port, and from the jetty port to Boracay island. If you’re flying in to Kalibo airport, simply hop in on a van bound for Caticlan. The fee for the 2-hour ride is Php 150 per person. If you’re flying in to Caticlan (and not via Seair), take a tricycle to the jetty port. It’s a short ride away, and shouldn’t cost more than Php 50. Seair passengers should go to the Seair office right across the airport. Inquire inside about the shuttle, and the friendly staff will guide you to the next shuttle bound for the port. On the final descent to Caticlan airport. That’s Boracay island near the top, and the many ships plying the route. Once at the port, a Seair representative will give you tickets for the banca going to Boracay island’s Cagban port. The representative will also lead you to the counter where you need to pay for the environmental and terminal fee (Php 50 each). For non-Seair passengers, you need to pay for the banca, which is Php 25 each. If you’re clueless (like I was when I went to buy my ticket after going back to Caticlan from the Ati-atihan in Kalibo), the girl behind the counter might sell you the ticket for the fastcraft, which costs Php 30. For the Php 5 difference, you get a bigger craft and an airconditioned cabin. The problem I had with this craft was that there’s only one plying the route, and you’d have to wait for it to come back from its run to the island. Whereas if you take the banca, there are plenty of banca waiting to take passengers to the island paradise, so you’ll be boarded and out to sea in no time. From Cagban jetty port in Boracay, you need to ride a tricycle to the town center. If you’re staying at one of the reasonably priced guesthouses in Station 2 (and you should!) tell the trike driver to drop you off at D’mall. If you’re renting the whole tricycle, the fee is Php 125. However, if you’re willing to wait and share the tricycle with other passengers, the fee is only Php 20 per person. When you get off at D’mall, just follow the throngs of people walking down the pathway and you’ll soon see the sparkling blue sea. 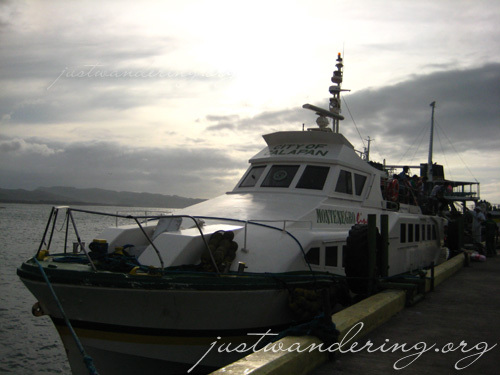 Another option of traveling to Boracay is to take the roll-on, roll-off (RORO) ship. It’s definitely cheaper, but it takes a lot longer. I’ve no idea how it’s like to take the RORO from Manila, but from a friend’s story, it’s a LOT of effort. Still, it gets you to Boracay. The RORO docks at the same jetty port in Caticlan, so if you’re headed to Boracay, you just need to pay the necessary fees and hop on the banca to Cagban port. Ironically, this fastcraft is named City of Calapan. Isn’t it so obvious that I was bored? The times were actually taken on the afternoon I was flying back to Manila. It was on a Tuesday afternoon, and probably not as crowded as it would be in the summer, so times may vary. At the very least, it gives you an idea on how much time to allot when you’re going back to Caticlan to check in for your flight. I hope this helps you in planning your trip to Boracay. I probably missed out some things or totally screwed up some facts (hey, it’s already 3:41 am!). If you see something amiss, or need clarification, just ask! this is a very comprehensive post. specially for those first timers in this beautiful island. Okay, IF you’re not flying down to Borocay, how long does it take? Let’s say a drive from Manila? Bchai: About a day, I think? Not really sure, because I haven’t tried it hehe. It’s a combination of drive & boat ride going to Boracay. thanks a lot 4d info. uhhm.i still have several questions. i do apologize 4 dat. 4 i am a first timer? i will leave my #. 09274681384. hope someone’s gonna help me! again. thank you! hi, i find your info very helpful, especially for first timers like me. i need more inputs though. i have company who is a bit handicapped by rheumatism. is getting on and off the banca or fast craft comfortable enough? also, which is the better, tans or taj guest house? thanks! what about flying manila-kalibo-manila with zest air? Do you recommend that? How long is the commute from the Boracay Island to Kalibo airport? Hi Len, I’m not sure, but a friend told me before that there are still boats from Caticlan to Boracay at 6pm. hi nina! i like your blog! tanong ko lng, is there a safe waiting place in the caticlan airport? kasi yung kasama ko e sa next flight pa and i will be waiting for him pa e thanks! I’m not too familiar with the surroundings of the Caticlan airport (because I usually head straight in and out of the terminal). I would suggest that you just wait for your companion inside the Caticlan Jetty Port, since there’s a big waiting area inside. thanks for this info, but i just want to clarify ….sorry medyo makulet. did i get it right? is the transport fee & enviromental fee is still the same as of this time? going back to kalibo we will just follow this instruction and we will pay again enviromental fee? hope to hear from you soon, were going to bora this feb and we don’t include our transfer to our resort reservation because the fee is so expensive (P1,100/pax).thanks so much. This is a bit of help! going to Boracay is easier than ever before because of the Filipino culture to help someone who is lost.